IPSEC is the most popular form of VPN used today. It is important to understand how IPSEC works in order to trouble shoot issues with IPSEC tunnels. IPSEC is an end-to-end security scheme. This means that data is encrypted on one end and decrypted on the other end of the connection. In tunnel mode ESP adds a new ip header, after encrypting the original ip header and payload. In both modes an ESP header field is added to the packet. The server and client negotiate an encryption algorithm that will be used to transport the encryption keys to be used during the transfer of data. Lifetime – Rekeying time in milliseconds. Phase two also occurs over UDP port 500. PSK (pre shared key) most commonly used, this is simply a pass phase that is shared. The best way to troubleshoot IPSEC is to look at a packet capture. 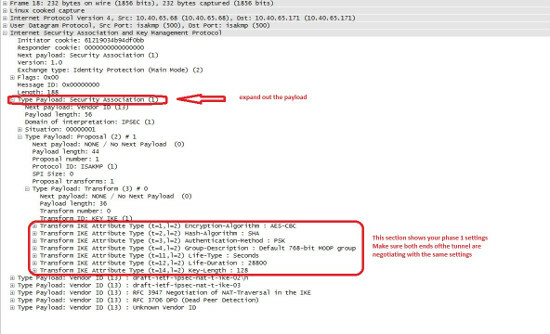 The IPSEC exchange is easy to see and identify in a packet capture. Here is a sample packet capture showing the ISAKMP information you will need when troubleshooting both ends of a site 2 site VPN tunnel. The packet you want look at is “Identity protection” this packet shows all of the phase one settings you are using to negotiate phase one between the two ends on the tunnel. There are several packets of this type. You will need to look at each until you find the one with the IKE attributes. After opening the packet you will want to expand out the payload so you can see how each end is set up. You can also expand each IKE attribute to see what their individual settings are. In this packet the initiating server is proposing the listed protocols it will be followed by an informational packet from the receiving server accepting the protocols or not accepting. In the following packet the proposal was not chosen. This means that the IKE 1 settings are not the same on both devices. And the receiving device is rejecting the proposed IKE 1 settings. Understanding How IPsec works will help you to set up and troubleshoot your Site to Site and client to site connections. 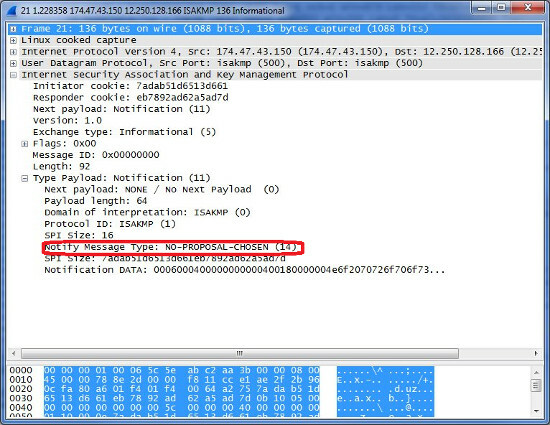 Packet captures are displayed in Wireshark.